Some of us like to add out pet names to our social networking profiles. But, if you’re using Facebook then it wasn’t actually possible to do so. But you can do it now by going to Settings. The alternate name added is displayed in brackets next to your actual name. The alternate name need not be in English, it can be in any other language. For instance; if you are Chinese then you enter a Chinese name, it will be shown in brackets. Now, when people search your profile, they may enter any of the two names. Both the names will be displayed while searching. This is quite helpful and helps us to connect with more friends. 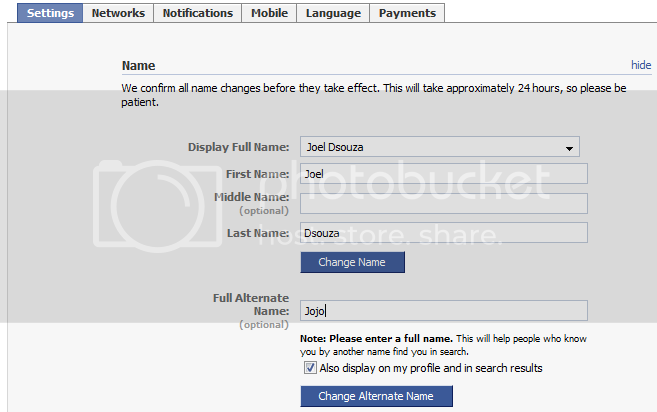 But note that, when you enter a new alternate name it takes 24 hours to display.